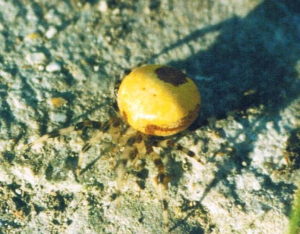 Observation - Yellow spider - UK and Ireland. Description: Found in scrubby vegetation on grassland during conservation work at a water meadow. In the second photo, it is in a yellow plastic cup. Found in scrubby vegetation on grassland during conservation work at a water meadow. In the second photo, it is in a yellow plastic cup.